Wow, I have a lot to share on my blog but in order to procure all this funness I have put 400 miles on the Prius odometer. So I will get it all organized and imaged up pretty, ( I hope). My sojourns to the DC burbs are always a sweet treat, especially because I hook up with my BFF Beth and assorted partners in crime. So I will get this all posted next but before that I wanted to share a recent thrifted find. I love it, not just because the thrift store had summed it up and tossed it into the fugly zone (priced $1), but because it is a fabulous before/after garden junk makeover. 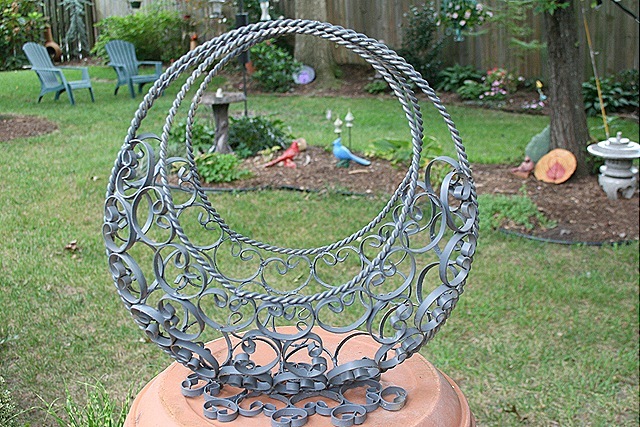 This wonderful "planter" is curled wrought iron painted gray. Did you know that in the hardware store they sell outdoor paint in a battleship gray? I see so many outdoor ornies painted this hardware store gray. ugh. Beth and I had a smashing good time at the Big Flea and my weekend visit in general. I have pictures to prove it!! I have a fabulous prom dress to photograph, you just wait! Oh goodness – what fun you had shopping and what a great planter you found. The green paint makes such a difference. Can’t wait to see your new prom dress – knowing you it will look adorable. That planter just needed the Suzy touch! You look great in Beth’s photos – love that skirt and purse! The green is so fresh and the perfect color for this. A very good save! Sounds like you had a wonderful time. Can’t wait to hear all about it. 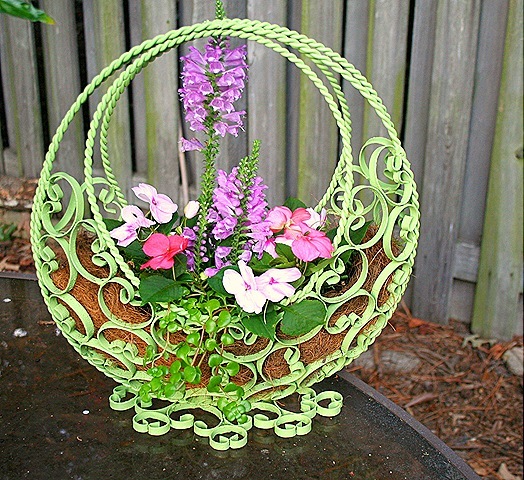 Great planter Suzy…you sure do have an eye for things like that! Can’t wait to see the pics of the flea. Ooh, I love it that shade of green! You’re so right. That gray is depressing. What a great planter – never saw one like it. Don’t ya just love finding a bargain like that & giving it a new dress? Thats so cute with its bright green makeover!